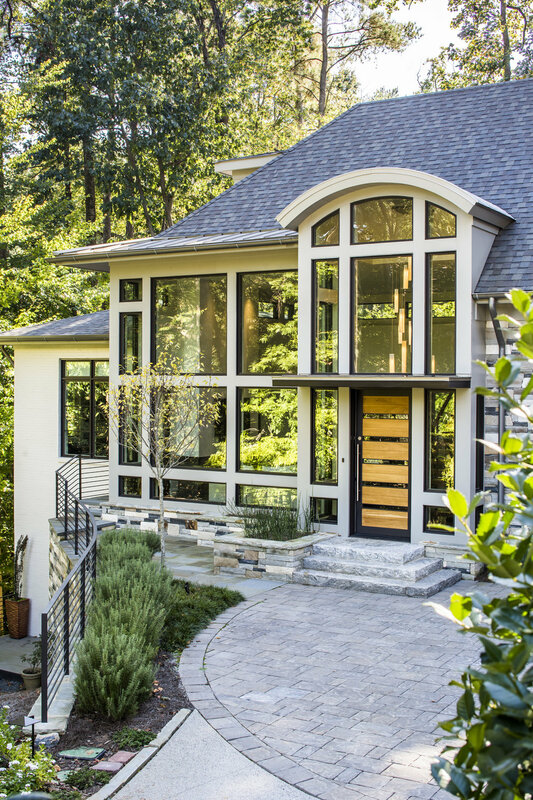 Modern meets transitional in this new build custom design where earthy textures that suited the homeowner's tastes, highlighted by the soft floods of natural light throughout all the living spaces, contrasts with clean lines and livable, comfortable spaces. Scale shifts that create both drama and intimacy, are accentuated by an attention to detail, inspired by the couple's personalities. Avid entertainers with an extended family, this empty nest couple wanted a "cool" social environment designed to entertain on a large scale for family and friends, but also feel the right size for them when family is away. 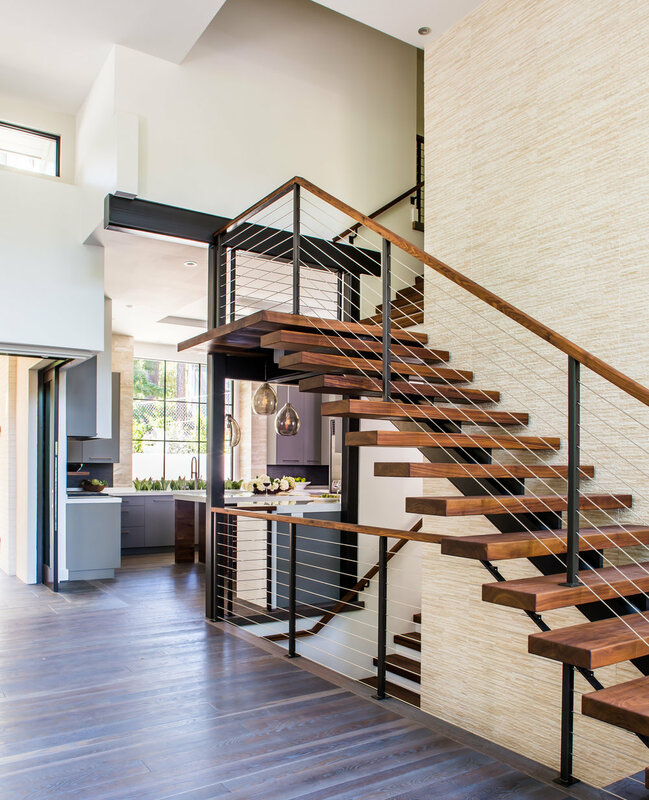 Dramatic features like the 'floating' walnut stair and custom foyer lighting add a playful modern twist while maintaining the ambiance of open flowing spaces. Work/play features include a separate "call" room for the a dual physician couple, for a separate work/sleep zone while on call. See Also Not Just a Kitchen: Indoor to outdoor living is the driving feature of this kitchen that transforms into an outdoor entertainment space with pocketed doors that open the living room and kitchen to one another, creating a seamless entertainment zone for a fun loving, social family. Work/play features include a separate "call" room for the a dual physician couple with sleep sofa and work area. See Also Warm Modern Bath in a Compact Space: "Cool", "functional" and "sophisticated" was the request for this warm modern bath. The minimalist shower enclosure transitions seamlessly into a custom built japanese soaking tub with a warm gray textural tile backdrop that creates a subtle and soothing flowing feeling in a compact space. Accents of natural walnut veneer on the vanity and an accentuated sliding water closet door, add warmth and balance to the shower and tub forms. Function is packed into every inch of this compact space with a custom mirror unit housing plentiful storage and hidden laundry bin.